Sad but true, my time in the kitchen lately seems to be either a quick stand-at-the-fridge breakfast, or a how-fast-can-I-get-something-on-the-table dinner. But over the weekend, I had the chance to get into my old groove, with the time and inclination to enjoy myself. It began with rhubarb. Rhubarb from plants that my father-in-law had transplanted from his own yard into ours some 20 years ago. Of course, the fresh stalks never fail to bring back fond memories of him. He liked to share food - like pumpkins he'd grow for our kids just for Halloween, like coffee cans full of white beans gleaned from his farmed fields, like dates he'd bring back when he and my mother-in-law snow-birded in southern California. Oh and most favored of all, those molasses cookies in the Tupperware on top of the fridge every time we went to visit. Oh yeah! Rhubarb. Well before I really got going, I reached for my apron - my Patchwork, Please one. And putting it on, well it reminded me of two things - one of my time working in a bakery, and two of my grandma. 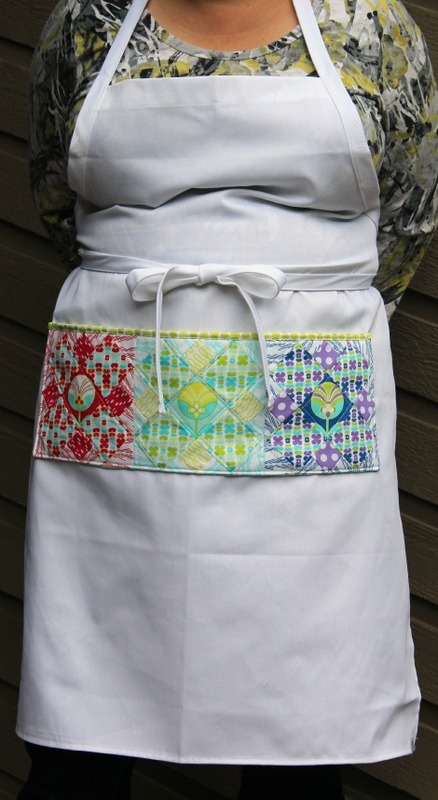 Funny thing, it's the grandma that taught me to sew that I remember most wearing aprons. I have a couple of them still, and I'm pretty sure she made them herself too. I decided to make muffins, mostly because they're easy and relatively quick. But gee whiz, even that decision took me back . . . to when daughter dear was in high school and once a week I'd bake muffins for her to take to school to share with her friends for breakfast. So what's with all the reminiscing already? So many memories - none really anything major, but each in their own way a reminder of the special connections I feel in the kitchen. Lots of times lately I'm too rushed or too preoccupied (with sewing projects most likely!) to linger there for long. But I'm glad I did that day. Beat egg, add milk, oil, and almond extract. Bake at 375-degrees for 20 minutes. Dip tops of warm muffins in sugar. Yummy! 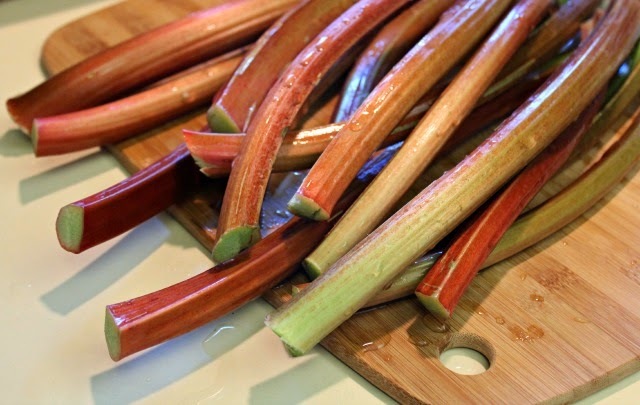 I have plenty of rhubarb in my garden, so now I have a good recipe for my hungry college sons! Oh I love rhubarb! But sadly no rhubarb here :-( What wonderful food memories you have - your FiL sounds lovely. Sometimes it is just nice to reminisce. Thank you :) We are in rhubarb overload in Indiana!! 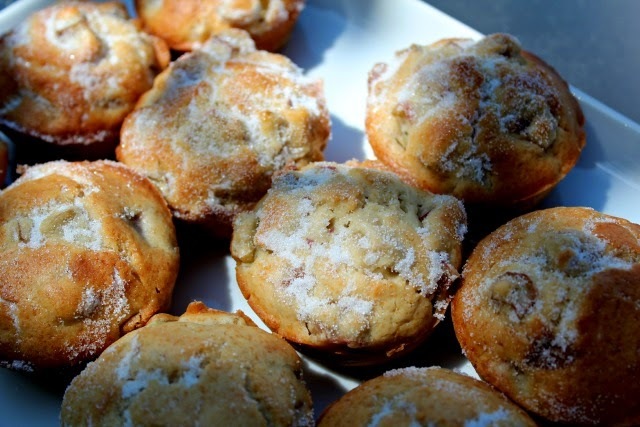 I just made the rhubarb muffins today, they are now cooling off in my kitchen. Both my son and I think they taste delicious! Great stories and memories, clearly you need some more time for baking. Such a lovely post! I loved seeing the apron again. What a nice mama you are to make muffins for your daughter and friends. I bet my daughter would love that. They stay after school a lot to do homework before marching practice and that would be a nice snack. This is a really yummy rhubarb recipe: http://www.commonsensehome.com/rhubarb-pudding-cake/ The picture doesn't look like much but it was veeery tasty. I added more boiling water than it called for to make it more pudding-y and less cakey. I just froze 8 pints of rhubarb but have a few cups still in the refrigerator and was wondering what to make. Your muffins look like the perfect recipe to try. If I like it even half as much as the raspberry torte, it'll be wonderful. Thanks for the recipes.